Based On Your Zodiac, This Is The Sabyasachi Lehenga You Would Want To Wear On Your Wedding! If you told us that you wished to wear a Sabyasachi lehenga for an upcoming wedding that's not necessarily yours, we would understand. 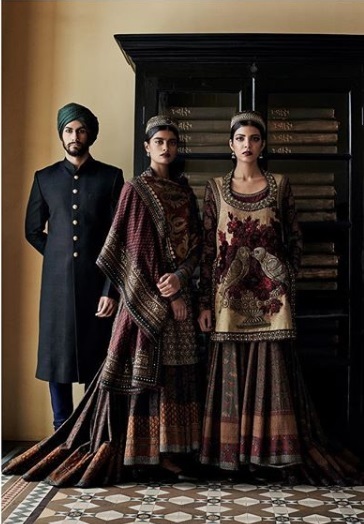 After all, the master couturier is the most sought after designer in the country, and if the string of weddings this past year has taught us anything, it's that Bollywood loves Sabyasachi just as much as we do! Now the fact that everyone from Deepika Padukone to Alia Bhatt is in awe of the man of the moment, i.e, Sabyasachi, is well known, but taking our love for him a little further, we decided to bring a little fun element to the game. 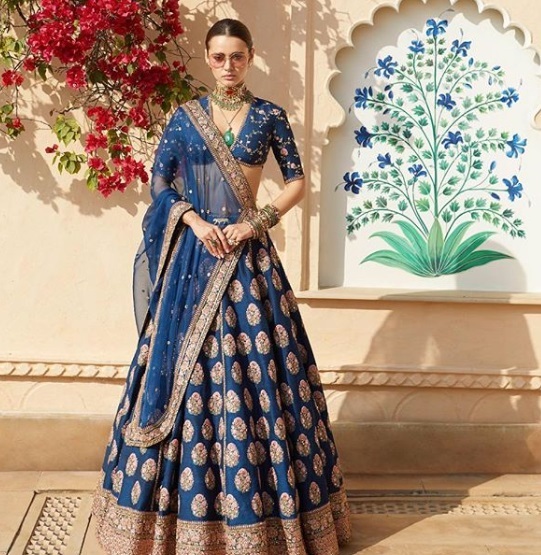 Remember how you browse through his dreamy collections thinking of the lehenga you would probably wear on your wedding? 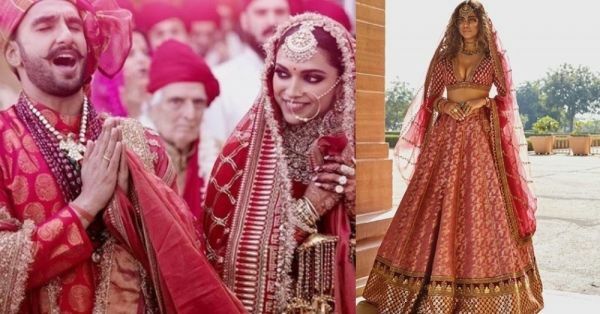 We sorted it out according to astrology, bringing you the Sabyasachi lehenga you will most probably want to wear, based solely on your zodiac. A penchant for distinctive style, along with a magnetic personality and love for DRAMA makes the Aries woman the perfect muse to Sabya's designs. You like attention and can go on for miles, exploring and experimenting with clothes. Does that mean an OTT offering that turns heads would be the right choice? We definitely think so. 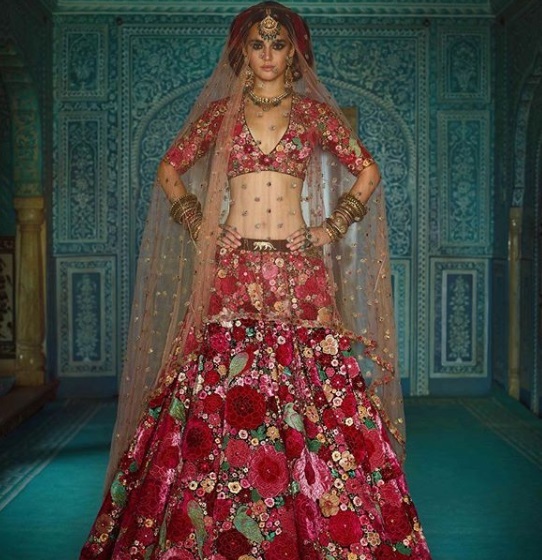 Our pick: This embroidered+emebellished floral lehenga with a dramatic veil. Material possessions may not be for everyone, but Taurus isn't one of them. They love what they wear and before they do, they make sure it's right up to the mark. Reliable and practical, Taureans take pride in what they accumulate and like to enjoy the feel of their fashionable picks. It helps that they are responsible for their possessions, and not likely to settle on something they don't like, which is how it should be. After all, its 2019 girls! Our pick: An overall gold tinted lehenga with a sheer dupatta. Their deep intelligence and need to be in the know-how makes Gemini girls informative, smart and extremely curious. They might change their mind in a jiffy, but Geminis have a gift for figuring things out in the smartest ways possible. We are thinking in sync with the latest trends and an on-fleek style! Our pick: What could be better for the trend-savvy Gemini than a distinct pick that is unconventional? If we had to place our bets on anyone who could pull off that regal shade of blue, it would be a Gemini. Imaginative, emotional and intuitive are some of the many excellent qualities of a Cancerian. 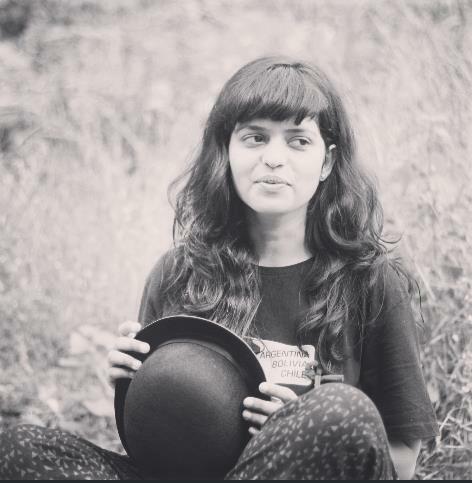 So it won't be surprising to see a dynamic person of this zodiac opting for a Sabyasachi lehenga that is equal parts striking and an ode to what's close to their heart. Our pick: A lehenga by the designer in a decadent emerald hue, with minimal yet emphasised embellishments. Leo, we know you love to be the centre of attention, and what better than a Sabyasachi lehenga to help you with that! People born under this sign are natural leaders; passionate and focussed in whatever they wish to achieve. Self-confidence too is something that comes naturally to them, so expect these bravehearts to be fearless when it comes to fashion, and everything else. Our pick: An all-black embellished lehenga with a blouse featuring a plunging neckline. Great attention to detail is what makes Virgos stand out from the crowd, so don't be surprised if you find them wearing the chicest details there are in a Sabyasachi lehenga of choice. Rest assured, these not-so-expressive people IRL go all out with their fashionably detailed clothes, and that's what we love about them! 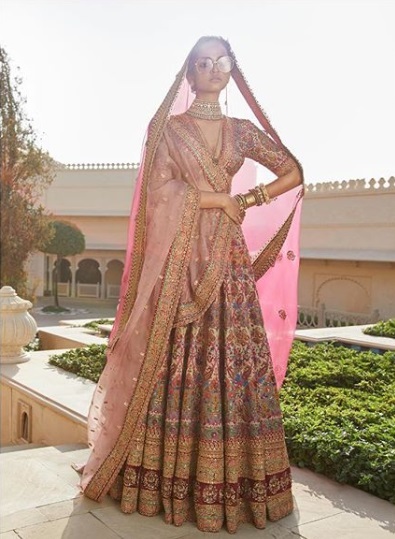 Our pick: This oh-so-amazing pale pink Sabyasachi lehenga with exquisite details to die for. Librans like to match and don't you let anyone tell you any different. So a monochrome pick with some uh-maze detailing should do it for these gracious individuals who find themselves fascinated by symmetry and equilibrium, what do you think? Not to forget the fact that they love the great outdoors, so the lehenga ought to match this criteria too, in case it's a day wedding! 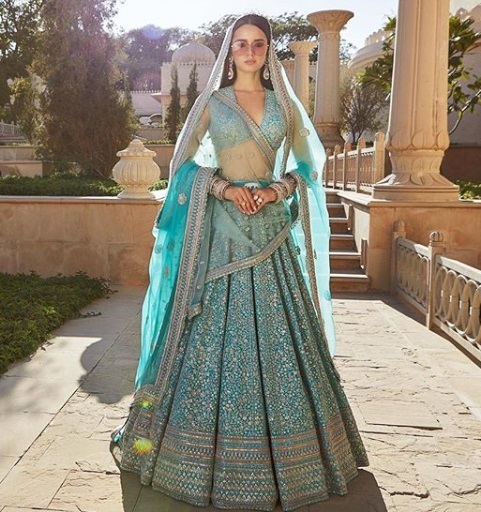 Our pick: The light blue lehenga isn't too overpowering and makes for the perfect pick for a summer or day wedding. Their intense passion and power that lies just beneath the surface are what drives Scorpians. Expect assertiveness and a purpose, even while they make a selection of what they wish to wear. The uninhibited nature of people under this zodiac makes them the perfect muse to try something new and completely out there. Our pick: See the different types of prints and embroidered details on the lehenga and the blouse? Only a Scorpion girl can don it with vigour and style. Saggitarians like to travel and really, could you blame them? 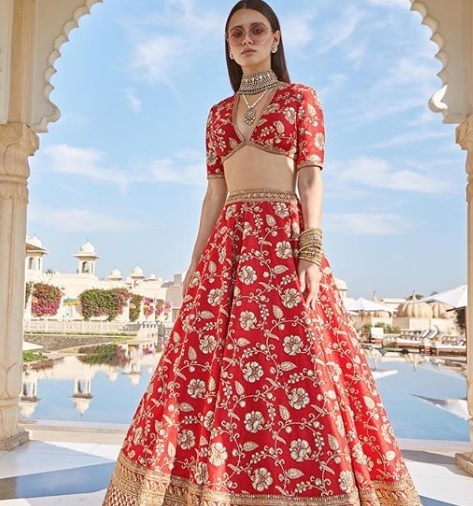 If their philosophical nature and love for all things travel were the main inspirations behind their lehenga, we wouldn't be surprised at all. As cultural themes amalgamate in their chosen trousseau, all we can expect to see is fireworks! Our pick: Distinct and rich embroideries and silhouettes, inspired by varied cultures come together in these beautiful creations which we would choose for the Saggitarians. Serene and disciplined creatures that Capricorns are, they are likely to pick something that's chic yet fuss-free, sans the frills and the drama. That's not to say that a bit of tradition won't seep into the lehenga, knowing their love for it. Our pick: A quaint, red lehenga with traditional inclinations but no frills. Orderly and scientific, Aquarians approach everything with a rational thought process which makes their choices and end goals original and progressive. Impulsive buys and spur of the moment thoughts are not traits to expect from the peeps of this zodiac, who believe in doing their thorough research. Impeccable and on-point! Our pick: A tone-on-tone ivory Sabyasachi lehenga that will fit in perfectly just about anywhere. Intuitive and creative, the people of this zodiac are born romantics, which should be enough to give you an insight into their minds. They also have artistic talents, which makes them folks with a good eye and an even better taste, especially when it comes to all things pertaining to art. Don't be surprised if you find them donning dainty drapes and silhouettes in a lehenga which brings out their sensual side. Our pick: Graceful drapes and colours that hint towards romance and reveries would be our selection for the Pisces girls.